Live from Chicago at Fourth Presbyterian Church for the Associated Church Press Conference. 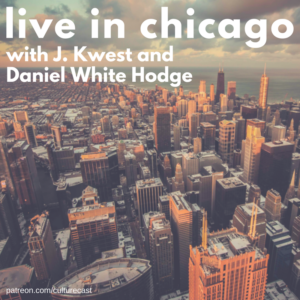 Gregg Brekke is Christian’s co-host with guests J. Kwest and Dr. Daniel White Hodge. Learn a little about the history of the Associated Church Press, and our sponsor Lutheran World Relief. If you go to lwr.org/coffee and use the promo code LWRCOFFEE, you’ll get 10% off your order of fair trade coffee. In News of the World, Gregg and Christian take a look at fake news and the responsibility and role of media in a fake news culture. has trust in media been misplaced? are we getting more realistic about the relative truth of all media? how do we define truth in a post-fact culture? how can we tell the difference between legitimate news and propaganda? Then, Daniel White Hodge, Associate Professor of Intercultural Communications at North Park University in Chicago, talks about the relationship between urban missions and colonialism, the lack of intercultural competencies in urban mission work, the prophetic voice in hip-hop, the history of hip-hop, how it has replaced the civil rights movement, and whether mainstream recognition of hip-hop is a good thing, or just another example of being co-opted by white culture. Plus, you’ll get to hear two live performances by J. Kwest, and the 3 (or 7) hip-hop albums everyone needs to have in their collection.